Fortune magazine used a Michael Douglas image to invoke Gordon Gekko, the ruthless fictional trader of 1987's film “Wall Street” for a June 2005 cover story. Hollywood imagery sometimes survives long after its initial introduction, moving its characters and message into mainstream culture, occasionally serving in useful instruction. That may be the case, at least in part, with a Hollywood character named Gordon Gekko, from the 1987 film Wall Street. Gekko is cast as the fictional archetypal hustler; the big-time trader/speculator/corpo- rate raider who made “greed is good” the signature catch phrase of the go-go 1980s. In the Oliver Stone film, Gekko is played to a tee by actor Michael Douglas. Douglas, in fact, won the Best Actor Oscar for his portrayal of Gekko, the unscrupulous corporate raider who stops at nothing to get what he wants. Nearly twenty years later, the fictional Gekko played by Douglas had left enough of an impression that he was used on the cover of the June 2005 Fortune magazine at right to spotlight a story on the new greed of Wall Street. And more recently, by 2008-2009, during the latest financial crisis, with greed still doing its thing big time, references to Gekko and his quips were once again being heard. And by May 2010, a sequel to the 1987 film, Wall Street 2: Money Never Sleeps, was released, featuring a reformed Gordon Gekko, having served his prison term. In the piece that follows here, however, the first film is the focus, exploring its history and audience reaction, and why in some cases its characters were emulated and its central message missed and/or unheeded. Producer Oliver Stone set his Wall Street film in the mid-1980s, around the time several insider trading scandals and prosecutions were in the news. The film also portrayed the high-flying life styles of New York traders rolling in their Wall Street largesse during that era. In addition to capturing the essence of the Gordon Gekko character and his “take-no-prisoners” school of capitalism, the film also featured the “wanna-be-like Gordon” strivings of young trader, Bud Fox, played by Charlie Sheen. Fox soon becomes Gekko’s protégé and partner in crime, living in the fast lane for a time, with an Upper East Side condo, beautiful live-in companion Darien (Daryl Hannah), while making bundles of money — all courtesy of Gordon Gekko. But young Bud eventually sees through his hot-shot mentor and the damages his wheeling and dealing can cause — including one plan to buy, eviscerate, and sell off as parts, the airplane company his working-class father, Carl Fox, is employed by ( Sheen’s fictional dad in this case is also his real one, Martin Sheen, playing a union leader who tries to warn his son that Gekko is using him). Bud gets caught by the Feds while doing some insider handiwork for Gekko, but later turns government informant, wearing a wire, to help send his former boss to jail. The film ends with Bud heading to court, presumably to seal the case against Gekko. Cover of the original DVD for the 1987 film “Wall Street.” Click for film poster. One of the more memorable and much quoted moments of the film comes when Gekko gives a speech at a shareholders’ meeting of Teldar Paper, a company he is planning to take over. This is the famous “greed is good” speech as Gekko defends his planned takeover, pointing to the bloated and wasteful ways of post-War corporate America, using Teldar’s management as Exhibit A, and claiming himself the company’s saviour — a “liberator” of value (see sidebar below). Parts of this fictional speech are reported to have come from actual speeches that real-world Wall Streeters had given — namely by corporate raider Carl Icahn and financial wheeler-dealer Ivan Boesky. Ichan had railed against corporate management who owned little of their own companies, had too many high-level executives, and were otherwise inefficient. 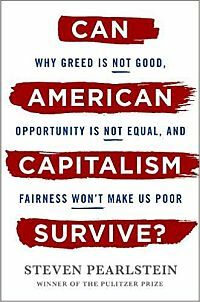 And Ivan Boesky is credited with inspiring the “greed is good” line, paraphrased from a May 18, 1986 commencement address he gave at the University of California, Berkeley, School of Business Administration. Boesky said then: “Greed is all right, by the way. I want you to know that. I think greed is healthy. You can be greedy and still feel good about yourself.” Boesky was later one of those convicted of insider-trading. Gordon Gekko adressing Teldar board from floor of shareholders meeting, "Wall Street," the movie, 1987. GEKKO: Well, ladies and gentlemen, we’re not here to indulge in fantasy, but in political and economic reality. America has become a second-rate power. Its trade deficit and its fiscal deficit are at nightmare proportions. Now, in the days of the free market, when our country was a top industrial power, there was accountability to the stockholder. The Carnegies, the Mellons, the men that built this great industrial empire, made sure of it because it was their money at stake. Today, manage- ment has no stake in the company! GEKKO: All together, these men sitting up here [pointing to Teldar management] own less than 3 percent of the company. And where does Mr. Cromwell put his million-dollar salary? Not in Teldar stock; he owns less than 1 percent. GEKKO: You own the company. That’s right — you, the stockholder. And you are all being royally screwed over by these, these bureaucrats, with their steak lunches, their hunting and fishing trips, their corporate jets and golden parachutes. CROMWELL: This is an outrage! You’re out of line, Gekko! Gordon Gekko, at Teldar, giving his "greed-is-good" speech. GEKKO: Teldar Paper, Mr. Cromwell, Teldar Paper has 33 different vice presidents, each earning over 200 thousand dollars a year. Now, I have spent the last two months analyzing what all these guys do, and I still can’t figure it out. One thing I do know is that our paper company lost $110 million dollars last year, and I’ll bet that half of that was spent in all the paperwork going back and forth between all these vice presidents. GEKKO: The new law of evolution in corporate America seems to be survival of the unfittest. Well, in my book you either do it right or you get eliminated. In the last seven deals that I’ve been involved with, there were 2.5 million stockholders who have made a pretax profit of 12 billion dollars. Thank you. I am not a destroyer of companies. I am a liberator of them! GEKKO: The point is, ladies and gentleman, that greed — for lack of a better word — is good. GEKKO: Greed is right. Greed works. Greed clarifies, cuts through, and captures the essence of the evolutionary spirit. Greed, in all of its forms — greed for life, for money, for love, knowledge — has marked the upward surge of mankind. And greed — you mark my words — will not only save Teldar Paper, but that other malfunctioning corporation called the USA. GEKKO: Thank you very much. Gordon Gekko and Bud Fox in Gekko’s office looking out on a New York city skyline. Click for promotional photo. Bud Fox at his trading desk where he sets out to make some quick bucks doing deals for Gordon Gekko. In the film, the character played by Hal Holbrook, a wizened and more thoughtful stockbroker, attempts to mentor young Bud Fox at the trading firm where both work. Holbrook represents, in Oliver Stone’s words, “the positive forces in the market.” He is also part Oliver Stone’s father, who was in real life a stockbroker for 40 years and believed Wall Street “could do a lot of good,” according to Stone. In the film, Holbrook, represents the old patient school of investing, and he tries to teach Bud Fox the ethics of the business. But Fox, at first, is more enamored of the deal, deal maker Gekko, and the quick, big money. Gordon Gekko: "Lunch is for wimps." Bud Fox getting a big account check from Gordon Gekko. At a dinner party gathering with Gekko, Darien (Daryl Hannah) and Bud’s father, Carl Fox (Martin Sheen, far right), discussing the Bluestar Airlines deal. Although Wall Street was not a box office smash when it first came out, the film enjoyed a bit of a renaissance in 1989 and 1990 as the prosecutions of Ivan Boesky and Michael Milken unfolded for their insider trading. Milken, best known as the “Junk Bond King” in the 1980s, was indicted on 98 counts of racketeering and fraud and was sentenced to 10 years in prison, though he served less than two. By 1990 Newsweek had a cover story that asked “Is Greed Dead?” Michael Douglas, in any case, left behind a memorable character in Gordon Gekko; a character who has stayed with the culture for some years now, and is periodically mentioned whenever Wall Street excesses flow. Through the 2000s, the film or Gekko received occasional mention, as in the 2005 Fortune magazine story. At the film’s 20th anniversary in 2007, a special edition DVD was released that included an introduction by Oliver Stone, extensive deleted scenes, “greed is good” featurettes, and interviews with Michael Douglas and Martin Sheen. Gordon Gekko, from "Wall Street" film, 1987. Click for wall art photo. Gordon Gekko telling the Teldar board and shareholders in “Wall Street” 1987 how his version of “greed-is-good” efficiency will work. …Gekko’s Greed is Good speech is still shown to MBA students at business schools. It is intended as a morality lesson, but ends up feeling more like a pep talk. At my old business school, Harvard, Gekko’s speech electrified a snoozy morning class on leadership. By the time Gekko was done berating the board of Teldar Paper, the entire class was grinning and alert. For most MBA students that speech is less a parody than a guiding phil- osophy. Over the past year, as Wall Street froze hiring and many MBA students struggled to find work, a wave of ethical re-evaluation swept business school campuses. A group of Harvard Business School students even came up with an MBA oath, vowing to be responsible, law-abiding, civic-minded business people. It was not the kind of thing anyone bothered with when the economy was roaring along and students could still fantasize about gliding from business school into a world of Gekko-ish riches. -John Varley, Barclays Bank Rewarding high-performing bankers with more pay, he explained, didn’t conflict with Christian values. Bankers in Britain had taken to the churches in response to critics who charged them with creating great disparities in wealth and inequality. A few weeks earlier, Goldman Sachs International adviser, Brian Griffiths, giving a talk at London’s St. Paul’s Cathedral had stated: “The injunction of Jesus to love others as ourselves is an endorsement of self-interest…. We have to tolerate the inequality as a way to achieving greater prosperity and opportunity for all.” Gordon Gekko, no doubt, would be smiling over that one, but others might find it downright un-Christian. Meanwhile, 20 years after the making of 1987’s Wall Street, Gordon Gekko was set to make a renewed appearance with a sequel of the film – this one set in the financial world of the late 2000s. 20th anniversary, 2007 DVD edition of 1987's “Wall Street” film, featuring Gordon Gekko. Click for DVD. The new Wall Street film had been rumored for years, and in October 2008, it was reported that 20th Century Fox began fast-tracking a follow-up production. 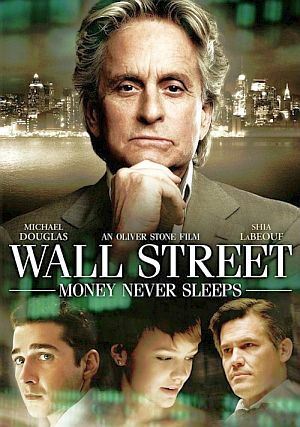 The sequel, Wall Street: Money Never Sleeps, was released in September 2010. In this film, Gordon Gekko has been released from prison, having served a 20-year sentence for his earlier nefarious deeds. Now, however, he faces a much different Wall Street than the one he left. The sequel would draw inspiration from the 2008-2010 credit crunch and money-making schemes of hedge fund swindlers. There would also be more emphasis on the role of investment banks and less on traditional stock trading. The field of play would be more global as well, ranging from Wall Street to Abu Dabai, the Far East, and other locations, but also including New York’s Federal Reserve Bank. …Gordon Gekko is delighted to see that his views on greed have spawned a growth industry. No longer must he endure criticism when he preaches that greed is good; his concept has in fact gained acceptance at the highest reaches of commerce. Even better, the United States government has taken the view that on the rare occasions when greed goes bad, the taxpayer will be there to pick up the tab. Gordon Gekko at his command post in “Wall Street,” 1987. To be sure, Mr. Gekko is sorry to have missed out on the billions he could have made during the subprime mortgage boom. But he recognizes that his exit from prison is perfectly timed in another way. In the aftermath of the credit bubble, 17,000-square-foot mansions in Greenwich, Conn., go begging, Gulfstream jets can be bought on the cheap and prestigious golf clubs no longer have years-long waiting lists. Because he went to jail for securities fraud and probably agreed to sanctions in the case, Mr. Gekko is barred from working for a financial firm or becoming a registered investment adviser. Still there are other possibilities: starting a hedge fund that accepts only a handful of wealthy and sophisticated clients, for example. Based in the Cayman Islands, the Gekko Insider Insights Fund will almost certainly specialize in high-frequency trading, the investment strategy du jour. Just as certain: investors, eager to hire a manager of such notoriety and business acumen, will throw billions Mr. Gekko’s way. Gordon Gekko and Bud Fox making plans for the trading day in "Wall Street," 1987. Click for promotional photo. Morgenson’s scenario for the film wasn’t exactly what Oliver Stone came up with, but it wasn’t too far off the mark on some counts, as Gekko in the sequel is only slightly reformed after his prison stay. And when the right opportunities present themselves for revenge and “good greed” some 23 years later, Mr. Gekko avails himself to what he does so well. Still, at the outset, after his prison term and beginning his life again, Gekko appears on a somewhat new path – author of a new book, Is Greed Good?, and as a lecturer of business students. However, in the sequel, Gordon Gekko is estranged from his daughter, Winnie (played by Carey Mulligan), although he hopes to repair this relationship. And in time, circumstances would present themselves for Gekko to forge an alliance with his daughter’s fiancé, Jacob “Jake” Moore (played by Shia LaBeouf), an idealistic stock broker who has already done well for himself. Although Jake comes to view Gordon as a father figure, he soon learns that Gekko is a master manipulator who will stop at nothing to achieve his goals. Gekko works his future son-in-law to help take down a Wall Street enemy (one who had played a role in sending Gekko to prison) and begin rebuilding his former empire. Along the way in this film, there is ample financial intrigue and manipulative wrongdoing, as Jake’s firm and his mentor there get burned. There are also revelations of Wall Street’s shaky underpinnings, personal tragedy, and more. Gekko, meanwhile, finds the means to get back “in the game” again, big time. Poster for 2010 film sequel, 'Wall Street: Money Never Sleeps'. By correctly predicting the coming financial collapse, Gekko — now set up in London, England — sells the market short and turns $100 million that he has “borrowed”/stolen from his daughter’s Swiss account trust fund (which he had squirreled away for her) into an incredible sum of $1 billion or more. Now a billionaire again, and having paid back the $100 million to his daughter and also invested in his son-in-law’s alternative energy venture, the timeline flashes forward a year or two, as a happy family scene closes the film, with Gekko now reconciled with his daughter, visiting her, Jake, and their young child. One YouTube writer, Randal Graves, offering a comment in 2014 on the movie’s trailer, noted: “This film was good… but not as good as it would’ve been if Bud Fox and Gordon Gekko teamed up again and bankrupted some hedge fund tycoons.” (Bud Fox only makes a brief appearance in the film). Stephen Lambrechts of IGN Australia concluded the film is not “quite the incendiary attack that it could have been, but it still has plenty to say…” And Boxoffice Magazine’s Pete Hammond called it a “…powerhouse of a movie that shines a light on the financial machinations.” As for lessons learned and ethical messages, those were mostly left to whatever film-goers might take away on their own accounts. Still, the real world events of the financial melt down of 2007-2008 and its aftermath — ably reported in a number of probing book-length accounts to date — offer standing lessons that provide the scarier truths. Additional business-related stories at this website can be found at the “Business & Society” category page, and include, for example: “Flash Boy Lewis” (covering Wall Street’s “flash trading” and Michael Lewis’s publishing history); “Celebrity Buffett” (Warren Buffett investing history and his rise to mainstream notice); “Empire Newhouse”( history of the Newhouse publishing empire through 2012 and Reddit.com); and “Murdoch’s NY Deals” (covering the rise and 1970s American expansion of the Rupert Murdoch media empire). This fake issue of Fortune magazine featuring Gekko appeared as a prop in the film, as shown by Bud Fox below. Bud Fox shows off boss Gordon Gekko on the cover of Fortune magazine. Bud Fox at trading desk with colleague Marv. Bud Fox meeting Darien, the interior designer. Martin Sheen, union man, with high-flying son wearing Gekko-esque braces. Cover of “Wall Street” the novel, a 241-page book based on the screenplay published in December 1987 and released with the film. Kenneth Lipper, a lawyer, investment banker and former New York City deputy mayor for finance & economic development, wrote the book, served as a technical advisor on the film and had a brief cameo role as well. The “Wall Street” novelization sold several hundred thousand copies globally. In another matter, Lipper, in a 2003 court action, was required to hand over millions to wronged investors in the aftermath of a hedge fund scam. Geraldine Fabrikant, “Wall Street Reviews ‘Wall Street’,” New York Times, December 10, 1987, p. D-1. Sheila Benson, Movie Reviews, “‘Wall Street’ Lays an Egg,” Los Angeles Times, December 11, 1987. Rita Kempley, Movie Review, “Preachy, Punchy ‘Wall Street’,” Washington Post, December 11, 1987, p. C-1. Roger Ebert, “Wall Street: Film Review,” Chicago Sun Times, December 11, 1987. Vincent Canby, Movie Review, “Wall Street,” New York Times, December 11, 1987. “Wall Street Movie Speech (1987),” American Rhetoric.com. “Wall Street” (1987 film), Wikipedia. org. Michael Cieply, Connie Benesch, “‘Wall Street’ Makers Look for Upturn; Financial Melodrama Doing Well in Big Cities, but Not Elsewhere,” Los Angeles Times, December 19, 1987. John Gross, “The New Greed Takes Center Stage,” New York Times, January 3, 1988, p. 21. Bettijane Levine, “Fashion 88: Men Are Bullish on Power Styles Seen in ‘Wall Street’,” Los Angeles Times, January 8, 1988. James K. Glassman, “The Monster That’s Eating Wall Street; Voodoo Credit, Buy-Out Mania Are Killing Value and Values,” Washington Post, January 10, 1988, p.C-1. Otto Friedrich, Richard Behar, Richard Hornik & William McWhirter, “Freed From Greed?,” Time, Monday, January 1, 1990. Steven Pearlstein, “Icon of an Era; Drexel Came to Epitomize Wall Street’s 1980s Excess,” Washington Post, February 14, 1990, p.1. “Predator’s Fall: Drexel Burnham Lambert,” Time (cover story), Monday, February 26, 1990. David A. Kaplan, “Wall Street: A Greed Apart; The Final Word (So Far) On ’80s Insider Trading,” Newsweek, October 14, 1991. Sylvia Nasar, Ideas & Trends, “Adam Smith Was No Gordon Gekko,”New York Times, January 23, 1994, p. 46. IGN Staff, “Wall Street: Greed is Good. This Movie is Better,” IGN.com, November 10, 2000. Daniel Akst, On the Contrary; “Was Gordon Gekko Right About Greed?,” New York Times, August 4, 2002, p.34. Michael Noer and Dan Ackman, “Gordon Gekko #14: The Forbes Fictional Fifteen,” Forbes.com, September13, 2002. Stefan Stern, “Gordon Gekko May Be Back In Fashion, “Book Review of Hardball,” Financial Times, Thursday, October 7, 2004. Andrew Ross Sorkin, Dealbook, “How to Show That You’re No Gordon Gekko,” New York Times, March 25, 2007. Telis Demos, “Oliver Stone: Life after ‘Wall Street’,” Fortune, September 21, 2007. Alex Cohen, “When Greed Became Good On ‘Wall Street’,” National Public Radio, NPR.Org, October 16, 2008. Frank Ahrens, “The Return of Gordon Gekko?,” WashingtonPost.com, October 14, 2008. Tatiana Siege, “Fox, Loeb up for ‘Wall Street’ Sequel; Michael Douglas Could Reprise Gekko Role,” Variety.com, October 13, 2008. Stanley Weiser, “Repeat After Me: Greed Is Not Good,” Co-writer of ‘Wall Street’ Worries That the Movie’s Message Is Misunderstood, Especially Now, Los Angeles Times, October 5, 2008. Kevin Rudd, “The Children of Gordon Gekko,” The Australian, October 6, 2008 (edited extract from speech by Australian Prime Minister Kevin Rudd). Alastair Jamieson, “Gordon Gekko to Return in Sequel as Film-Makers Trade on Credit Crunch,” The Telegraph (U.K.), January 19, 2009. Owen Gleiberman, “Wall Street: What it Still Has to Tell Us,” Entertainment Weekly, March 28, 2009. Flavia Krause-Jackson, “Vatican Slams ‘Greed Is Good’ Wall Street Mantra,” Bloomberg.com, July 28, 2009. Tim Arango, “Greed Is Bad, Gekko. So Is a Meltdown,” New York Times, September 7, 2009. Zach Wise & Timothy Arango, Video, “A Conversation With Oliver Stone,” New York Times, September 8, 2009. Gretchen Morgenson, Considered, “Fast-Forwarding Gordon Gekko,” New York Times, September 13, 2009. Philip Delves Broughton, “Wall Street 2: Gordon Gekko is Back,” London Evening Standard, September 14, 2009. Bryan Burrough, “The Return of Gordon Gekko,” Vanity Fair, February 2010. “Yearly Box Office – 1987 Domestic Grosses,” BoxOfficeMojo.com. “Wall Street: Money Never Sleeps,” Wiki-pedia.org. “Wall Street 2: Money Never Sleeps Trailer,” YouTube.com, posted by Jumpoff, Sep-tember 25, 2010. Dana Stevens, “Gekko Never Sleeps: Michael Douglas Returns in Wall Street 2,” Slate.com, September 23, 2010. Roger Ebert, “Wall Street: Money Never Sleeps,” Chicago Sun-Times (Sun-Times Media Group), September 23, 2010. Stephen Lambrechts, “Wall Street: Money Never Sleeps AU Review,” IGN News Corporation, September 7, 2010.